1) what is the MAXIMUM temperature jet fuel (kerosene) burns at? I don't know why people think steel has to melt in order to collapse. Anyone that has worked metal knows it gets very soft way before it actually melts, in fact it doesn't even need to be red hot to get soft enough to be pliable with simple hand tools. Why did the CCTV building in Beijing not collapse? Look at those flames!!! Yet this building collapsed. 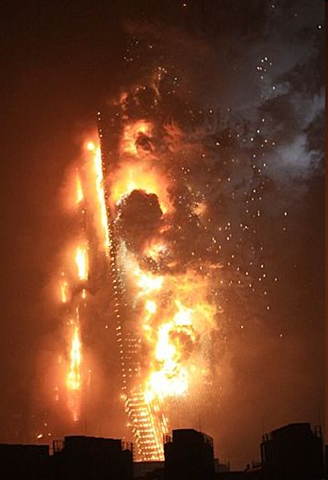 The fires at the CCTV building were magnitudes greater! WTC7 was not run into by a jumbo liner. There were minimal fires. It is a fair question. Or do you not want to debate? 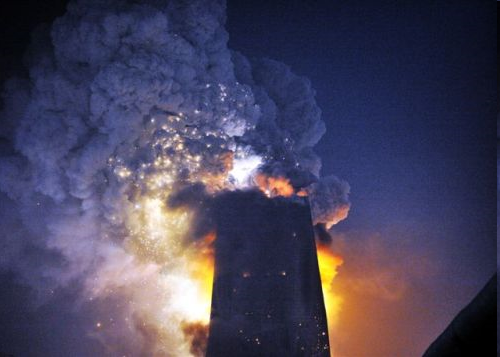 Again, there were minimal fires in WTC7 and it was not hit by a plane or major building debris. The building was intact. Yet it collapsed at the speed of gravity a couple of hours later. And then when you look at the CCTV building in Beijing it practically exploded and had massive fireballs even larger than the twin towers and yet it did not collapse and is still standing to this day. BTW, go to the link. China Smack is replacing the images I linked with collage art. I will reupdate the links later today. As explained before, in the Manhattan project only a few peole knew the big picture. Not all 130,000 people employed by that project knew the total scope. Thus it was a secret until after the bomb was dropped and the masterminds came forward and told everyone about the project. Of course you could see the results for yourself, but had they said it was the Mango project this would also have been good enough. Heck few people involved even knew it was called the Manhattan Project. Some people had small parts like: "Please deliver this box to that office". That's it. You make it sound like all people involved (1000's) would need to come forward if 911 was a CT. Many would most likely not even know they were involved. Ok, lets say you worked for a demo company and worked on either WTC 7 or the Towers. that would take at least a dozen people. Not one after that fact comes forward and says: "I cant sleep at night, we worked on the towers in the months before, hope nothing we did contributed to this." ? ? ? ? Well, if said demo company placed the explosives they would have known full well before 911 that their handiwork would assure the death of thousands of people come September 11th. You think these kind of people would have trouble sleeping at night? Does Brevik have trouble sleeping at night after killing close to a hundred people in Oslo? No, there are certain kinds of people (thousands if not hundreds of thousands) that will do anything for a cause and show no remorse. Just like the female spider show no remorse eating her mate. It's a cruel world out there no doubt. I don't think it would have been an average demo company btw. Jesse Ventura himself worked on demolition for the military, not a demolition company. There are many people outside of demolition companies that can demolish structures. You can't deny it is damn strange that WTC7 came down a couple of hours later. And the media was very quiet about it. And we know Sliverstein said in a video interview that they decided to pull the building (WTC7). 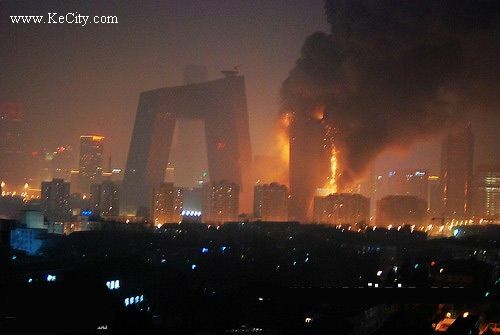 The flames and explosions at the CCTV tower were magnitudes greater than WTC7. Look at the videos and photos! Anybody looking at this objectively will question WTC7. I'm not saying no. I am trying to imagine in actuality how a CT would play out and how all the moving parts and all the people necessary to pull that off could get away with it and not screw up given all the human factors. Well, personally I feel they have screwed up. For example, the Pentagon video footage shows a flying object crashing into the side of the building. Yet it is much smaller than the plane they claim flew into it. That is one screw up right there. With all the lies coming out of DC do you even believe anything they say or do anymore? Obviously they do not care about the citizens. They are absolutely willing to replace the European descendants in America with Hispanic, African and Asian populations. That is why they are not closing the borders and sued Arizona for trying to do something about it. Killing a few thousand to make a point is not beyond these scumbags. They thought nothing of sending 50,000 soldiers to death in Vietnam all because of a lie. Human life is expendable to them. History is our evidence. How many millions have been killed because of a few scumbags in history? how was the construction of the building in china? codes etc...the same as here in the US? materials used? materials from different companies? there are so many different variables that its not even funny, but you look at one video from the internet and automatically jump to the WT7 was a controlled demo? the problem with cters is they dont look at things objectively, youre a prime example of this. Or can i expect avoidance and subject jumping as usual? Yeah and you have avoid my argument showing how the manhattan project doesn't compare all. What questions are there in your mind? If it does not conclusively point to a false flag operation, what does it indicate? If we were not the masterminds behind 911 how can we do this? The point of opening another investigation is to find this out - who was involved, etc. Your question can be answered only if we have all the information. Which we don't and doors have been shut investigating this at the government level. It would help if the government opened 911 up to an INDEPENDENT, PUBLIC investigation. Without any restrictions. What have they got to lose if they are not involved? Coleen Rowley - When the so-called "20th hijacker" Zaccharias Moussaoui was detained on August 15th, 2001, agents in the Minneapolis FBI field office immediately sought a criminal warrant to search his belongings. Management at the FBI dealing with the request threw up numerous obstacles to the agents, and even withheld information from them, including the now-infamous Phoenix Memo written by an agent in Arizona warning of terrorists training in flight schools for a possible upcoming attack. The request was denied and agents were prevented from searching Moussaoui's laptop, which contained information that would have tipped the FBI off to the 9/11 plot. The Minneapolis field office Chief Counsel, Coleen Rowley, has been very public with her disgust at the conduct of FBI management during the case and its subsequent review, and she has supported causes like NYC CAN which seek to re-open the 9/11 investigation. Richard Andrew Grove - In 2000, Richard Andrew Grove was working for Silverstream Software, a software development company specializing in enterprise architecture software. By October of that year he had landed the firm their largest client in the company's history: Marsh & McLennan. After finding evidence that Silverstream was overbilling Marsh by nearly $7 million and being told to keep quiet by both his own management and those he confided to at Marsh, he was fired. After his termination, he was invited to present his evidence at a staff meeting in Marsh's offices where Marsh employees who were suspicious of such transactions themselves were gathered. That meeting was on the 98th floor of the World Trade Center. It was the 11th of September, 2001. And everyone who was in attendance at the meeting died there that day. Grove, who had been late for the meeting, survived. His remarkable story, as well as subsequent events, led him to start piecing together how 9/11 helped financial institutions and insurance companies cover up billions of dollars in fraud by eliminating those who were asking questions about it. Robert Wright - In the 1990s, Special Agent Robert Wright of the FBI's Chicago field office spearheaded an investigation into terrorist financing codenamed Vulgar Betrayal. The investigation uncovered information about Yassin Al-Qadi, a terrorist financier who would go on to be designated a global terrorist financier by the U.S. treasury in the wake of 9/11. Vulgar Betrayal led to information about the African embassy bombings in 1998 and resulted in the seizure of $1.4 million of terrorist financing. Despite the investigation's remarkable success, however, Wright was taken off of Vulgar Betrayal in 1999 and reduced to a paper pusher. In 2002, Wright went public with information about how his investigations had been systematically starved for funds, hindered and obstructed by FBI management and revealed that he believes 9/11 could have been prevented if he had been allowed to continue his investigation. The Bureau prevented him from releasing a book about his experience. He was threatened with legal action if he revealed any details about what he had been investigating. After seeing fast n furious,nothing surprises me. Barry Jennings - Barry Jennings was the Deputy Director of Emergency Services for the New York City Housing Department. On the morning of 9/11, he received a phone call informing him that a plane had hit the World Trade Center and asking him to go to the Office of Emergency Management in World Trade Center Building 7. Arriving at the office with New York City Corporation Counsel Michael Hess, the men discovered that the OEM had been abandoned. When they attempted to leave there was a series of explosions inside the building, trapping them in the stairwell. Eventually Jennings and Hess were rescued by firefighters, and as they were leaving World Trade Center 7, they had to step over a number of bodies. Jennings' account contradicts the official government explanation of the collapse of World Trade Center 7 at 5:20 p.m. that day, which stated there were no explosions or casualties in the collapse. Jennings died on August 19, 2008 under extremely suspicious circumstances. A 9/11 explosives whistleblower has just been killed in the Netherlands through car failure. Car failure is a well-established means of assassination. Rather than leap to the conclusion that foul play is not suspected, under the circumstances, I’d prefer to leap to the conclusion that it probably was. Thanks to Roth and Lynda. Danny Jowenko, Dutch demolition expert and (involuntary) whistle blower on the 9/11 bombings was killed in a one-sided car accident in the village of Serooskerke, The Netherlands, on July 16th. For unknown reasons, his car veered off the road and hit a tree. He was killed instantly. Indira Singh - As a risk management consultant for J.P. Morgan in 2001, Indira Singh was tasked with implementing the next generation of risk management software for the firm. Working for one of the largest financial institutions in the world, Singh wanted to choose a reputable software vendor for the task, one with a proven track record of working with the sensitive information of important clients. She solicited a presentation from Ptech, an enterprise architecture software firm whose clients included some of the most sensitive departments in the U.S. government, including the FBI, the Department of Defense, the Treasury, the IRS, the US Navy and the White House. After performing due diligence on the company, Singh discovered that it had been started in part by funds from Yassin Al-Qadi (the same Specially Designated Global Terrorist that Robert Wright's investigation had been focused on). She discovered many other disturbing links between Ptech officers and suspected terrorist organizations. Ptech had been conducting tests on the interoperability of FAA and NORAD computer systems in the event of an emergency on the morning of 9/11. When she tried to bring this information to the FBI in Boston she was told by one agent that she was in a better position to investigate the case than the Bureau was. We send you our heartfelt thanks and the thanks of a grateful Nation for your selfless efforts in responding to the tragic events of Sept. 11. Your actions in the midst of this national tragedy were truly heroic. Your saving a man who was on fire by dragging him out of an elevator and getting him to an ambulance reflected the best of the American spirit.